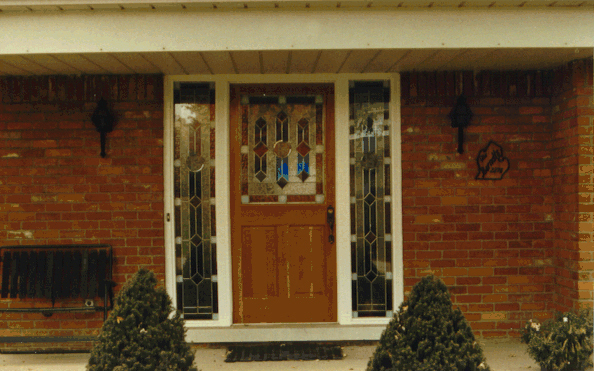 Brief Description of Subject: Gothic pattern in two sidelights and one panel in operable front entry door. Consists of water, textured, milk, glue-chip and beveled glass in clear, glue-chip, mixed amber, white opaque, blue, purple and red. Came is 5/16” crowned zinc. Graphic in each of 3 beveled clear round medallions is masked and sand blasted. The medallions represent family name & occupation. 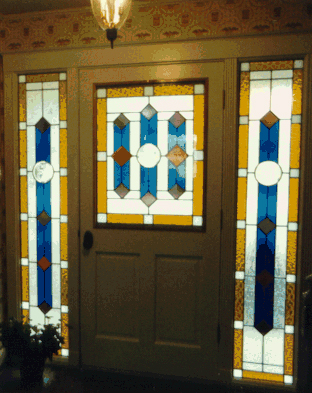 Designed and installed by homeowner. Inscriptions: Family initial “B” represented by movable-C (tenor/alto) clef sign in medallions.